I get fed up when I am wearing a pendant on a cord and then I realise the clasp has twizzled round to the front and is distracting from my beautiful creation. I keep meaning to design some necklaces where the clasp is a feature but until I get round to that here’s a couple of tips to avoid it happening. 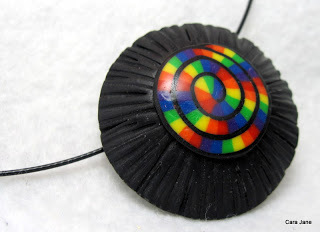 Tip 1 – Add a little extension chain (which also makes the length changeable) to the jump ring the clasp clips too and add something to hold it dangling down, here a little matching polymer clay bead. You can buy ready made little extension chains but I find they are too light on their own and still twizzle. I just bought a length of chain and used a 3cm or so length. Tip 2 – This idea came from Caroline Harvey, Beads from the Coast, you can see more images in her flickr gallery. You wrap a bit of wire around the cord in the centre and then poke it inside the bail. Wouldn’t work for all pendants. I tried it on one of mine and once I got the thickness of the wire wrap so it fitted snugly in the bail it worked brilliantly. thanks for sharing the tip with us! 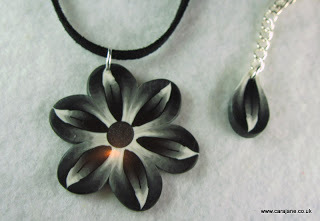 Tip 3 – Use crimps or knots to hold the pendant/beads in place. The pendant shown below has some little beads and crimps holding it in the centre of the wire, the weight of it stops the twizzling. I have done this with simple knots either side if on a couple of wide pendants if I am using cord. I can’t find a picture of knots though but you get the idea I am sure. If you have any other tips do let me know in the comments below, I am sure others would be keen to see them. Hope you can find a way to string your things so you don’t end up showing of the clasp. Great tip on using a bit of wire…will try that. I have used crimps as well, but it is tougher when using thicker cording. Thanks for sharing this! Thanks for spreading the word, Cara! Thanks for the ideas, Cara, I wish I had some others for you right now but I don’t. It’s a real problem and nice to have at least some kind of solution! Great tips! I’m going to have to try them out.